How Many Aroniaberries Per Day? I’ve been doing quite a bit of research on the Aronia Berry, including how it stacks up against other popular berries and where it’s grown. It’s been an interesting and sometimes enlightening study particularly when it comes to the USDA ORAC scale. ORAC is an acronym for Oxygen Radical Absorbance Capacity and measures antioxidants in food. The scale quantifies the TAC or total antioxidant capacity of a food by mixing the food with certain molecules that generate free radical activity and other molecules that are vulnerable to oxidation. The ORAC value was developed by Dr. Ronald Prior in conjunction with the USDA and NIH to measure the total antioxidant free radical fighting capacities in certain foods. For example, 100 grams of the Aronia Berry has an ORAC number of 16,062. In fact, most of the berry family falls well short of the Aronia Berry on the ORAC value scale. The history of the Aronia Berry is also a fascinating study as the berry was originally used for a number of purposes by the Native American cultures in North America. The leaves and twigs of the Aronia Berry bush were a staple used for medicinal teas and herbal remedies to treat everything from colic to fever. The juice of the berries was used as dyes, war paint and for treating cuts and abrasions. During the long winter months, dried berries were used to boost nutrition and health among the Native American tribes. Aronia Berries were also a much used to cure and tenderize various meats. The cured, tenderized meats were called pemmican (dried meats) and were used for food during the harsh winter months when game was scarce. Smoothie Bowls have become all the rage for breakfast and afternoon snacks. Whether you prefer greens, berry fruit, or other veggies, fruits, grains, or seeds, these bowls are filled with nutrition and "berry" delicious. To make a smoothie for a smoothie bowl use less liquid. The result: a thicker, yogurt-like consistency that serves as a perfect bed for your healthy toppings. 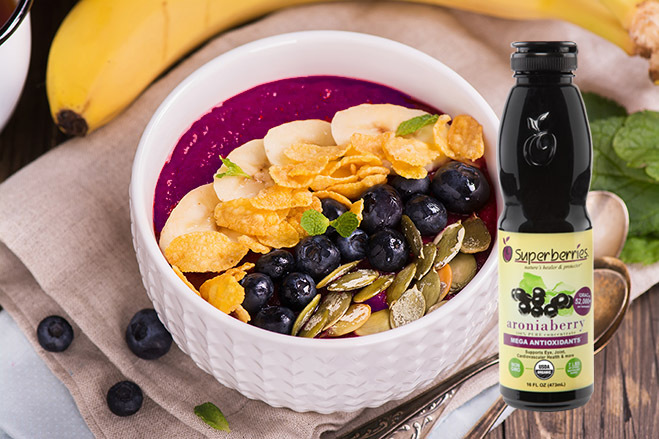 Add Superberries' Aroniaberry Concentrate or Frozen Aroniaberries to your smoothie recipe to unleash nature's most powerful antioxidant. Exposure to UV rays can lead to skin erythema (sunburn), which is a skin injury caused by damaged sunburned cells and can eventually lead to melanoma. Antioxidants in the diet or on the skin have been demonstrated in some studies to actually reduce the number of burned cells caused by direct exposure to high sunlight. Antioxidants have also been shown in these studies to remove free radicals from direct UV ray exposure before the ultraviolet radiation can cause extensive damage to the cells of the skin. This Coconut Aronia Berry Ice Cream Recipe combines coconut milk, pitted dates, and Frozen Aronia Berries for a "berry-licious" frozen treat without added sugar. This Aronia Cheesecake Popsicle recipe combines the delicious and nutritious flavor of the aroniaberry and greek yogurt to make frozen treat that is loaded with antioxidants. The summer months are upon us and the search is on for healthier treats to cool the fires that burn after an intense workout, an arduous morning of yard work or a guilt-free after dinner treat. I’ve spent a number of years attempting different recipes that would satisfy my palate and alleviate some of the guilt I felt in indulging in two of my favorite summer treats; ice cream and popsicles. The results were sometimes mixed at best, and attempting to get the kids into kale popsicles didn’t exactly work in my favor.